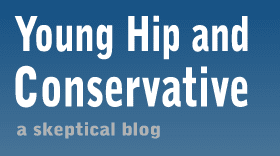 Young, Hip and Conservative: a skeptical blog: How did I miss that? I'm no expert on writing, and you're an order of magnitude above me, but "Order of magnitude" was used in two blog posts in a row. Just stood out for me - fyi.